It was Kellei´s Birthday yesterday (in case you didn´t notice) and so, of Course, we went for a dive - it was amazing! 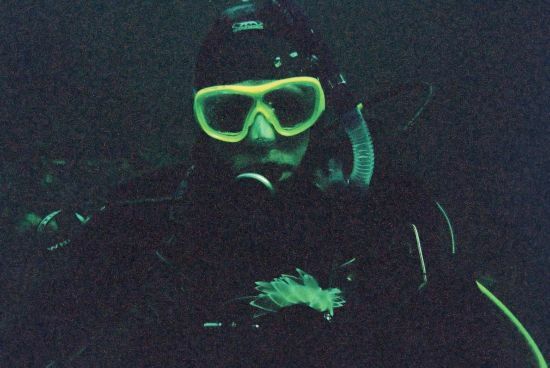 Close to 100´ visibility (for the non divers amungst us - anything over 20´ is spectacular for cold water diving) It was made even better because it was my first Boat dive. Remember ´Marquita´ from two days ago... well Brian had offered some time ago to take us out diving - so we finally took him up on his offer and headed out to Piper Pt. in Sechelt Inlet for a dive that was new to me and Kellei hadn´t done recently. It was a beatuiful clear day and we could see the bottom from the Boat at About 40´ After gearing up, Brian dropped us the dive3 flag - and that was where the fun started. We made this dive flag ourselves and had never used it for anything but shore diving when Kellei is teaching... it sank! the Line was set to 30´ (just right for teaching) and the float wasn´t quite enough to counteract the weights on the end so down it went ;) no problem - we just happened to be all set to go - so our first dive turned out to be a recovery operation. About 5´ down the landscape opened up Below us - with the immense visibility we could see for what felt like miles. Kellei has seen this before as it´s very common in winter diving in our area - but it was a first for me. As usual there was life everywhere - tons of perch, ling cod, rock cod, shript etc... My experience has been that on most dives there seems to be one lifeform that is in abundance - sometimes it´s brittle stars, sometimes fish - this time is was sea squirts - at 55´ on our first descent the rocks were carpeted with the transparent kind - thousands of them. Anyway - we got in two dives and had a blast... so nice that Kellei has her birthday - to give me an excuse to take a day off and go diving.